NEW YORK (CNNMoney) -- While many Americans worry that the Social Security Administration won't have enough money left to pay their benefits when they retire, the agency is doling out millions of dollars to people who aren't even alive. The Social Security inspector general estimates that the agency has made $40.3 million in erroneous payments to deceased beneficiaries -- even though the administration had already recorded their deaths in its records. The estimate is based on a sample tested during its most recent audit in January 2008, the watchdog agency said. One man told CNNMoney that he notified Social Security four years ago that his mother had passed away, but he still can't get the agency to stop sending her checks every month. Dennis Marvin, a Cleveland-based financial advisor, said several of his clients have grown frustrated by how long it took them to convince Social Security to stop sending payments to deceased family members. 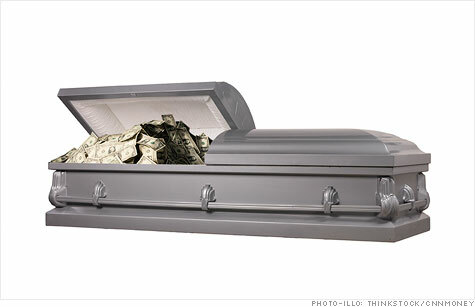 Hey Social Security, I'm not dead! "My clients are very concerned about whether Social Security is going to be there for them -- there's a tremendous lack of confidence in the system," said Marvin. "The fact that some of the benefits they could get are being taken away because they are being spent on the deceased just adds fuel to the fire." Typically, family members or funeral directors notify the Social Security Administration of a person's date of death. The deceased's identifying information, including their Social Security number, date of birth and date of death, is then added to the agency's Death Master File, a database that contains 87 million death records. People who fail to report this information and continue to receive payments risk fraud charges and will be forced to repay the money. California resident Rand Washburn, for example, was charged by the San Diego County district attorney with cashing in on more than $300,000 in Social Security checks that were sent to his mother for about 15 years after she died. After burying her body in the backyard, he failed to report her death to authorities, according to the DA's office. Washburn pled guilty to felony grand theft. Even in cases where the Social Security Administration has received notification of a death and adds the data to its master file, it has continued to make erroneous payments. The inspector general estimates that as of January 2008, nearly 2,000 deceased beneficiaries were receiving benefits for months or even years after the agency had been notified of their deaths. If those payments were not stopped, the SSA likely dished out another $7 million in additional payments over the course of 2008, the inspector general estimated. The Social Security Administration did not return calls or e-mails requesting comment on these errors or what it has done to reduce erroneous payments. In its report, the inspector general estimated that the Social Security Administration could save about $152 million in unnecessary costs this year if it does a better job identifying who is actually owed money and who is not. In addition to paying deceased beneficiaries, the inspector general's review found that the agency overpaid about $313 million to 89,300 beneficiaries and improperly paid about $7.3 million to 11,912 non-beneficiaries. The audit also found that of the approximately 2.8 million death reports the Social Security Administration receives per year, about 14,000 -- or one in every 200 deaths -- are incorrectly entered into its Death Master File. These million-dollar mistakes come at a time when millions of elderly and unemployed Americans are relying heavily on Social Security's disability program to get by. "Any threat to a person receiving his or her [Social Security] benefits would add another level of worry to the already shaken sector of senior citizens," said Gail Cunningham, a spokeswoman for the National Foundation for Credit Counseling, a nonprofit organization representing credit counselors. About 21 million Americans expect to depend on Social Security in retirement as their main source of income, according to the Transamerica Center for Retirement Studies. In 2011, 55 million Americans will receive monthly benefits from Social Security adding up to $727 billion in benefits, according to SSA.